Autumn fruit is lively and bright: crisp apples, pears that positively drip with nectar and crunchy pomegranates that burst with juice. They partner beautifully with Fuyu persimmons and hazelnuts, too, for this Autumn Fruit Salad. A light vinaigrette of kombucha, hazelnut oil, ginger and maple syrup dresses the salad . When autumn tables are filled with pies, tarts, and harvest cakes, an autumn fruit salad offers a nice alternative. The salad is still sweet, and still festive, but it provides that lightened up note so needed when kitchens brim over with heavy winter vegetables like squash, potatoes and beets, roasts and sweets. To make an autumn fruit salad, pick the freshest fruit you can find. In addition to apples, pears, persimmons and pomegranates, you can also add other autumn fruits like cranberries, figs or concord grapes. Slicing the fruit thinly not only makes for a beautiful presentation, but it also makes the salad easier to eat – and your guests can get a bite of everything in the salad on a single fork. A vinaigrette fulfills to functions when making this Autumn Fruit Salad. Apples, pears and other pomaceous fruit are prone to browning when they’re exposed to the air; however, acids prevent them from browning. In this fruit salad, we pair kombucha tea – which is highly acidic and similar in flavor to apple cider vinegar – with roasted hazelnut oil, maple syrup and ginger to make the vinaigrette. The acidity in the kombucha helps to prevent the apples and pears in this salad from browning. Its tartness also acts as a foil for the fruit’s natural sweetness. 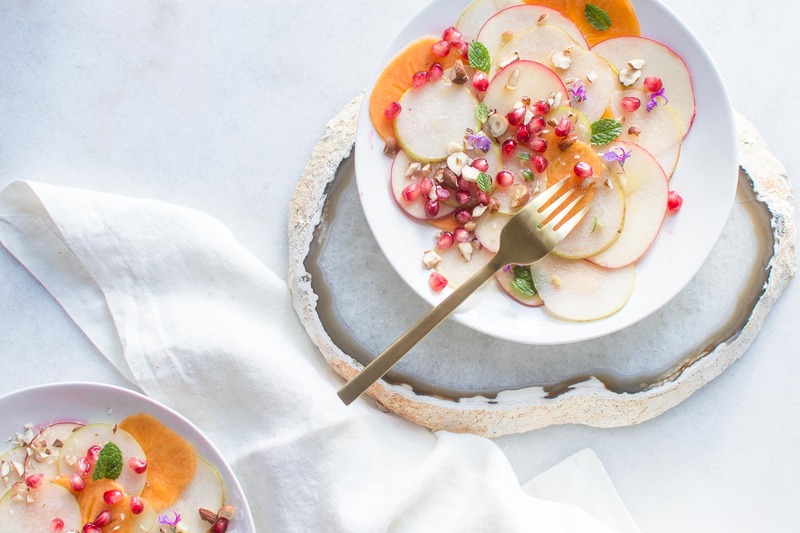 Apples and pears which make the base of this salad are particularly high in quercetin, an antioxidant that is highly anti-inflammatory and that can even act as an antihistamine. Similarly, persimmon is particularly high in powerful antioxidants as well, like beta carotene and vitamin C, while pomegranate arils are a good source of potassium and a very good source of various other nutrients like punicalagins. Punicalagins are powerful antioxdants which may account for why pomegranate has such a higher antioxidant activity – even higher than red wine and green tea. Together these, nutrient-rich foods, pair with hazelnuts and hazelnut oil which are high in a nutrient that can be relatively difficult to get through food sources: Vitamin E. Vitamin E helps to support cardiac health and helps to prevent damage to tissues from free radicals. Lastly, the kombucha tea used in this Autumn Fruit Salad’s vinaigrette is rich in beneficial bacteria that help to support gut health and immune system function. 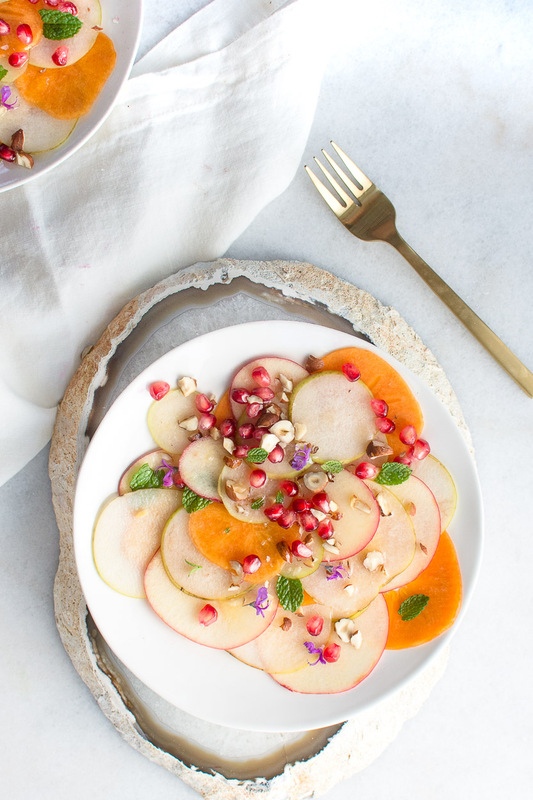 This autumn fruit salad is filled with thinly sliced apples, pears and persimmons, then dotted by fresh, juicy pomegranate arils and crunchy bits of chopped hazelnut. This salad is delicately dressed with a vinaigrette made from kombucha, hazelnut oil and ginger with the lightest touch of maple syrup for sweetness. 3 tablespoons roasted hazelnut oil (Find it here). Core the apples and pears. Then slice the pears, apples and persimmon no thicker than ⅛ inch, using a mandoline (like this one) or very sharp knife. Layer the pears, apples and persimmons on a serving dish, and scatter the pomegranate arils, chopped hazelnuts and fresh mint over them. Whisk the kombucha, maple syrup, ginger and roasted hazelnut oil together, then drizzle the vinaigrette over the fruit, and serve immediately. If you don't have kombucha tea, substitute apple cider vinegar. Persimmons are tricky. Make sure to use the squat Fuyu persimmon as opposed to the tear-drop shaped Hachiya. Fuyus are sweet at all stages of ripeness, whereas Hachiyas are astringent and inedible until completely and fully soft. You can also chop the apples, pears and persimmons instead of slicing them thinly. If you’d like to add this salad to your menu, there’s a few ways you can add it to the table. 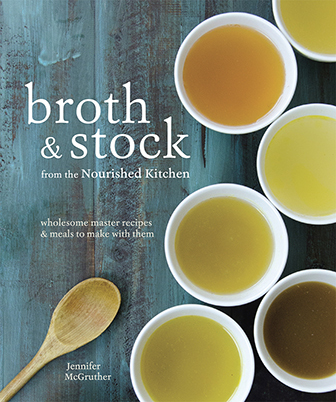 You can pair it with holiday favorites for a light addition to the table, and it also pairs beautifully with light soups for an easy lunch. This Autumn Fruit Salad fits perfectly on the Thanksgiving table as a light addition to heavier dishes like Slow-Roasted Turkey or Pumpkin Custard. It also partners well with lighter foods too, like Salmon with Honey Chipotle Bourbon Butter and Cucumber and Fennel Quick Pickles. Fruit salad also pairs well with this Instant Pot Red Lentil Dal that comes together in only 6 minutes. Jenny, I made this yesterday to take to our family’s Thanksgiving dinner. It was delicious AND gorgeous. I used apple cider vinegar instead of kombucha and added a generous pinch of salt to the dressing. I’ll be making this salad all winter long using different combinations of fruit. Thanks for this genius recipe!